After his explosive finale at the end of season 5, might Arrow fans expect to see John Barrowman's Malcolm Merlyn again? According to producers, the ball is in the actor's court. While Merlyn (seemingly) died during season 5's finale, stepping on a landmine to protect his daughter Thea Queen, some fans didn't believe that his ending was permanent, noting that characters have survived worse on Arrow as well as its sister shows, The Flash, Supergirl, and DC's Legends of Tomorrow. Executive Marc Guggenheim's response? Basically it's that the fans are right, but that doesn't guarantee Barrowman's return. Shortly before the finale, word leaked out from one of Barrowman's convention appearances that he did not intend to come back to Arrow in season 6, with the implication that his character would die in the finale. You can see video of the exchange below, via Green Arrow TV. 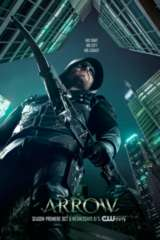 Arrow will return for its sixth season on The CW on Oct. 12, 2017, with the season premiere episode titled "Fallout." The premiere will mark a move from its traditional Wednesday time slot to Thursday nights at 9 p.m. ET/PT.